Congregations often define their success in welcoming visitors by the number of people that actually become members. At our congregation we have shifted the focus to improving the quality of our welcome, and it feels like maybe we’re onto something. Everyone is different and nothing is very straightforward. This is our mantra. There is no one pattern for the way people enter, engage and join our congregation. Every person and every situation is different. We try to honor that and not insist on uniformity. This requires flexibility and improvisation on our part, but it enriches our understanding of welcoming and the beauty and diversity of the body of Christ. Previously, we waited until we had a critical mass of newcomers to schedule a day to welcome new members. Now, at the start of the year, we schedule two dates a year to welcome new members — in the fall and spring. This has helped us move from a mindset of “if people come” to “when people come.” That approach has extended into Sunday mornings as well. We confidently expect that there will be someone new and plan accordingly. Maintain an expansive idea of community. You don’t have to be a member of our congregation to be part of our community. Thanks to the Internet and social media, people are part of our community long before they arrive at church — if they ever come. They have a sense of who we are, what we do and how we live the gospel through our Web site, Facebook page and Sermon Blog. We don’t have new-member classes. Our only welcoming event is a brunch that we have a few weeks before welcoming new members in the spring and fall. The brunch is always a graceful event. New people can meet each other and meet current members of the congregation. We find that the inculcation that congregations try to instill at new-member classes happens more naturally and more fruitfully through conversation, visitation, involvement and developing relationships. People don’t want to hear about it; they want to experience it. Enable people to participate right away. Our congregation used to have an unspoken waiting period for participation. People would regularly be members for months or years before being asked to take a leadership role. Now, we encourage people to get involved before they are members. We believe that you don’t need to be a “member” before you can start living out God’s calling in your life. Not joining does not equal failure. 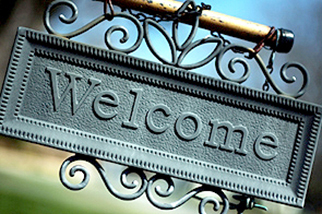 The end result of welcoming is not necessarily membership. If someone only comes for one Sunday, then we have ministered to them in some way. If people are with us for awhile and decide not to join, we feel we’ve contributed to their discernment process. If you make welcoming about membership, it’s a setup for disappointment. Not everyone will join and there will never be enough new members. Make it about ministry instead and decide how you will measure success. Listen for the way God is calling people to live out their faith — at work, home and in the church. Set people free to follow God’s call. The individual transforms the institution, not the other way around. We have a dream that one day, when we tell the stories of our congregation, we won’t tell time by when pastors came and left, but when people came to our congregation — not “And then Pastor Anderson was called…,” but rather, “Then Karen and Katie joined the congregation….” We expect newcomers to transform us, not for the congregation to make everyone the same. One of the best things we did to be more welcoming was to no longer have official greeters — those people congregations place near the front door to welcome people. By designating certain people, it let everyone else off the hook. Now, it’s a shared responsibility. Every Sunday after the service, as I greet people leaving the sanctuary, there are several members engaging visitors in conversation. It is a beautiful scene. There’s always a fear that you will drive people away if you are too assertive. That’s a risk we are willing to take. Except for one or two exceptions in five years, this has never been a problem. Indifference and indecisiveness are far worse than assertiveness. Originally posted Jan. 24, 2011, at Pastor Keith Anderson. Republished with permission of the author. Find a link to Keith Anderson’s blog Pastor Keith Anderson at Lutheran Blogs.